BCN Urban Bonavista i Barcelona, Spania: Bestill nå! 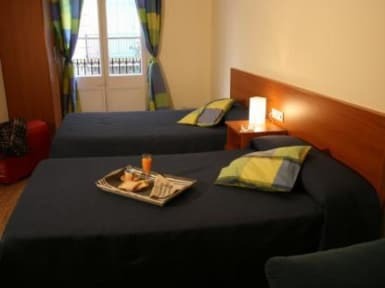 The Hostal Bonavista is a hotel with excellent value for money, located in the popular Gràcia district of Barcelona, just 200 meters from Diagonal Metro Station. It features comfortable rooms with free Wi-Fi and satellite TV. The bedrooms are functional and have large comfortable beds. The rooms have telephone and satellite TV. The hotel has a lounge with TV. Just 50m from the hotel there is a gym located in the Hotel has an agreement to allow guests a discount on entry. Cancellation Policy: Free cancellation 48h before check in day. For later cancellations or no show 85% of the first night will be charged. Method of payment, credit cards accepted upon arrival: Cash or Credit Card / Visa, MasterCard or AMEX will be accepted.